What are heart failure symptoms and signs? What are the risk factors for heart failure? What are heart failure stages or classifications? What is the treatment for heart failure? What diet and lifestyle management techniques help heart failure? What medications treat heart failure? What procedures or surgery treats heart failure? Which specialties of doctors treat heart failure? What are the potential complications of heart failure? What is the prognosis and life expectancy for a person with heart failure? Dr. Mimi Guarneri, MD, FACC, ABIHM, is board certified in cardiovascular disease, internal medicine, nuclear medicine, and holistic medicine. Dr. Guarneri is president of the American Board of Integrative Holistic Medicine and serves as Senior Advisor to the Atlantic Health System for the Center for Well Being and Integrative Medicine. Dr. Guarneri is founder and director of Guarneri Integrative Health, Inc. and Taylor Academy for Integrative Medicine Education and Research located at Pacific Pearl La Jolla in La Jolla, CA. The definition of heart failure is when the heart cannot pump efficiently enough for blood to circulate oxygen-rich blood throughout the body. When the heart becomes weak or when it becomes thickened and stiff, the heart muscle cannot keep up with its workload. Symptoms are usually worse at night when lying flat. Risk factors for heart failure include high blood pressure, prior heart attack, obesity, smoking, alcohol abuse, vitamin deficiencies, sleep apnea, heavy metal toxicity, eating an unhealthy diet (including animal fat and salt), and being sedentary. The cause of heart failure is a weakened or thickened cardiac muscle. When risk factors for heart failure are present, there usually is inflammatory stress, which further damages the cardiac muscle, depleting cells of energy and antioxidants. There are four stages of heart failure, used to classify the severity of symptoms. Heart failure treatment includes lifestyle and diet changes, taking medications, and sometimes implanting devices. Heart transplant may be needed in some cases. Medications can help reduce the symptoms of congestive heart failure (CHF) and improve heart muscle function. Commonly prescribed medications for heart failure include beta-blockers, diuretics (water pills), ACE (angiotensin converting enzyme) inhibitors, and ARBs (angiotensin receptor blockers). The prognosis for heart failure is highly variable. If lifestyle changes are not made, or medications are not taken, or the underlying causes are not correctable, heart failure can become a progressive and ultimately fatal condition. fatigue and a decreased capacity to exercise are other symptoms that commonly result from heart failure. Early symptoms and signs may not be apparent, and symptoms may develop only after the condition has progressed over time. The term heart failure can be frightening, but in reality, it just means that the heart is not pumping as well as it could be. When the heart muscle is weak, blood cannot be pumped efficiently enough to get oxygen to all of the cells. Sometimes the heart becomes dilated and weak. Other times it may be stiff and thickened. Over time, the heart cannot keep up with its workload. When this happens, there isn't enough oxygenated blood reaching the brain and muscles, and fluid begins to backup in the lungs and other tissues. The lack of oxygen causes the main symptoms of heart failure such as fatigue, shortness of breath, and difficulty completing tasks that require exertion. The heart has four chambers through which blood pumps. Newly oxygenated blood is pumped from the lungs to the left atrium and left ventricle and out through the aorta to circulate through the rest of the body. After the oxygen has been used, the blood returns through the veins to the right atrium and right ventricle into the lungs to be re-oxygenated. Systolic heart failure (left-sided heart failure): When the heart loses strength on the left side (left ventricle) and cannot pump the blood into circulation, it is called systolic heart failure or left-sided heart failure. When this occurs, the heart becomes dilated and weak. The strength of the heart muscle can be measured with an echocardiogram that measures the ejection fraction. An ejection fraction of 70% is normal. The term congestive heart failure, or CHF, refers to the accumulation of fluid in the tissues. Fluid can accumulate in the legs causing swelling (edema), into the lungs causing pulmonary edema, or into the abdomen where it is called ascites. A type of heart failure termed acute decompensated heart failure is an emergency. Diastolic heart failure (right-sided heart failure): The second type of heart failure is diastolic heart failure, characterized by the bottom chambers of the heart becoming thicker and stiffer. 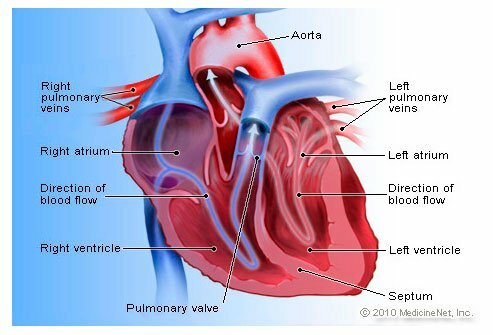 When this happens, the left ventricle cannot fill with sufficient blood, and not enough blood is pumped into circulation, even if the pumping action is still strong. This is why diastolic heart failure is sometimes referred to as heart failure with preserved ejection fraction (PEF), or right-sided heart failure. If the signs and symptoms of heart failure are present and the ejection fractions is greater than 50%, diastolic heart failure may be considered, especially if an echocardiogram shows the heart muscle is thickening. Symptoms are usually worse at night when lying flat. Symptoms are very similar for systolic and diastolic heart failure. Your doctor may need further testing to see which type you have. All of these also contribute to coronary artery disease, which is a major risk factor for heart failure. The cause of heart failure is a weakened or thickened cardiac muscle. For example, in chronic high blood pressure (hypertension), the heart must pump extra forcefully against the additional blood pressure. First it becomes enlarged and thickened. But over time, the heart weakens, scarring (fibrosis) develops, and it becomes less efficient at pumping. It can become larger (dilated) and weak or thickened and stiff. When the risk factors for heart failure are present, there usually is inflammatory stress, which further damages the cardiac muscle depleting cells of energy and antioxidants. While doctors define heart failure in stages or classifications, it represents a progression of heart muscle weakness. Sometimes people refer to this process as chronic heart failure but technically that term isn't correct. Class I: no limitations in activity. Normal activities can be performed. Stage A: No heart failure, but at high risk due to another medical condition that can lead to heart failure, such as high blood pressure, diabetes, obesity, or coronary artery disease. Stage B: The heart has been damaged by the patient's other medical condition(s) or other factors, but no symptoms are present yet. Stage C: The heart is damaged and the patient is experiencing heart failure symptoms. Stage D: The patient has severe heart failure that requires specialized care, despite receiving treatment (end-stage). Heart failure can be diagnosed by physical exam, reported symptoms, or chest X-ray. An echocardiogram test can identify a low ejection fraction or a thickened, stiff heart muscle. Echocardiograms may be used to distinguish between systolic and diastolic types of heart failure. Blood tests such as BNP (beta naturetic peptide) suggest heart failure. Algorithms and guidelines exist to score and weigh signs and symptoms to help make the diagnosis. Heart failure treatment options include making healthier decisions about lifestyle and diet, taking medications, and sometimes implanting devices. Heart transplant is sometimes considered for certain individuals. In acute or decompensated heart failure, the person may need hospitalization or even intravenous medications to help recover. Talk to your doctor before taking any herbs or supplements. In severe heart failure, devices can help the heart pump better. Left Ventricular Assist Devices (LVAD) are implanted mechanical pumps that are most commonly used when people are waiting for heart transplants. When medications and lifestyle haven't stopped the progression of heart failure, surgical transplantation of a donor heart can be lifesaving. Other surgical procedures can sometimes be performed earlier to address the risk factors and causes of heart disease such as coronary artery bypass, percutaneous coronary intervention, or angioplasty to open the blockages of coronary atherosclerosis. You may initially see your primary care provider (PCP) such as a family practitioner or internist, and in a sudden or severe situation you may be seen by an emergency medicine specialist in a hospital's emergency department. You will be referred to a cardiologist, a specialist in disorders of the heart. You also may see some sub-specialties of cardiology, including a cardiac electrophysiologist, who specializes in electrical and heart rhythm problems, or a cardiothoracic surgeon if surgery is needed. The complications of heart failure include severe fatigue and weakness, inability to complete activities of daily living, kidney damage, and progressive heart failure that could ultimately require heart transplant. The course of heart failure is highly variable. People who address their risk factors and make lifestyle changes may never progress. However, if changes are not made, if medications are not taken, or if the underlying causes are not correctable, heart failure can become a progressive and eventually fatal condition. This means that the heart muscle will continue to get weaker and have more difficulty keeping up with the workload. Fortunately, many treatment options exist for heart failure. The best way to prevent heart failure is to never have a heart attack, but if you do, there still are treatments. The Lyon Heart study demonstrated that a Mediterranean diet can prevent heart failure among people who have had a heart attack. Following other healthy lifestyle recommendations such as not smoking, not abusing alcohol, eating a plant-based diet, eating a diet that is antioxidant rich, eating an anti-inflammatory diet such as a Mediterranean diet, and being physically active every day may also help prevent heart failure. Treating early signs of heart failure and risk factors such as high blood pressure, being overweight or obese, and hardening of the arteries (atherosclerosis) are also strategies to prevent congestive heart failure. Stress raises blood pressure, worsens diabetes, and causes coronary artery disease. Learning stress resiliency techniques such as Transcendental Meditation, Yoga, or meditation can reduce the risk of many types of cardiovascular disease. American Heart Association. "Warning Signs of Heart Failure." Updated: Aug 10, 2016. Annette (Gbemudu) Ogbru, PharmD, MBA. "Beta Blockers." RxList. Updated: Apr 25, 2016. Annette (Gbemudu) Ogbru, PharmD, MBA. "Diuretics." Updated: Apr 25, 2016. Brook RD, et al. "Beyond medications and diet: alternative approaches to lowering blood pressure: a scientific statement from the american heart association." Hypertension. 2013 Jun;61(6):1360-83. DeVries, S., Dalen, J. "Integrative Cardiology." 1st edition. 2010 Oxford University Press. heartfailurematters.org. "HOW HEART FAILURE IS GRADED." 2016. U.S. Food and Drug Administration. "Angiotensin Receptor Blockers (ARBs) Information." Updated: Jul 09, 2015. Even if you think you're getting enough fruits and vegetables per day, how can you be sure? Take the Diet & Nutrition Quiz to learn more about eating right. Want to know what the good and bad fast-food sandwiches choices are? Our experts explore the nutrition facts of major restaurant chains like Subway, Burger King, Wendy's, Quiznos, Blimpie, Arby's and Boston Market, and tell you how to avoid the worst diet-killers. Protein is a staple in our diets, but what happens if we get too much? Take this quiz to find out the truth about protein and what's behind the high-protein diet craze!